Representing almost three decades of work, Trilogy explores the poetic imagery of Mexican photographer Flor Garduño. 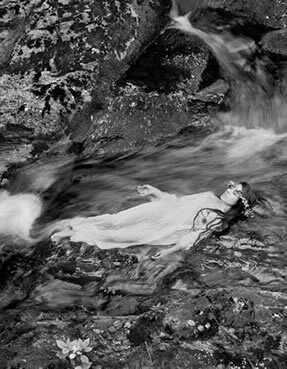 Garduño’s images investigate nature, dreams, and the female form. The exhibition is divided into three sections: Bestiarium, Fantastic Women, and Silent Natures. Through a surrealist, dream-like perspective, her works recall ancient rituals and the power of the feminine. Her mystical works captivate and amaze, always evoking a deep emotional response. William Shakespeare said that art is a mirror held up to nature. This is certainly true for Garduño’s unique vision. The mirror she holds up to the world reflects many things, including--the real and the mythical, the natural and the staged, and the factual and fictional--all meant to create her own visual mystical realism. Flor Garduño studied Visual Arts at the San Carlos Academy for the Arts at the Universidad Nacional Autónoma de México. In 1979 she began working as an assistant to Manuel Alvarez Bravo. By 1985 she published Magic of the Eternal Game the first of her many books. Her work has been awarded several important prizes including twice receiving the Swiss Federal Fund for Culture Prize, the German edition of the Kodak Award for her book Witness of Time, and the Photo District News Award for the book Inner Light. 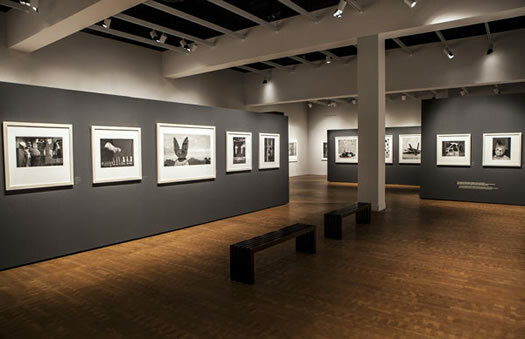 Her photographs have been widely exhibited in Europe, Latin America and the United States and are held in many permanent collections, including The Museum of Photographic Arts, the Museum of Modern Art, the Art Institute of Chicago and the Biblioteque National in Paris. This exhibition is available for presentation through 2019. Flor Garduño Trilogy - 240 pages with 96 plates. Available in English and Spanish. Preface by Francisco Reyes Palma and critical text from Alfredo Lopez Austin, Tereza Siza, and Guido Magnaguagno. Published by Contrasto, Rome, IT. Flor Garduño, the celebrated Mexican photographer, had a confession: Photography was not her first love. Then there was Manuel Álvarez Bravo. Four decades later, Ms.Garduño, 58, is herself a major influence on Mexican and Latin American photographers working today. Her black-and-white images — she favors still lifes, nudes, portraits, street scenes and explorations of indigenous cultures — are included in the permanent collections of the Museum of Modern Art in New York, the Art Institute of Chicago, the National Library of Paris and the Louis Museum of Cologne, among others. 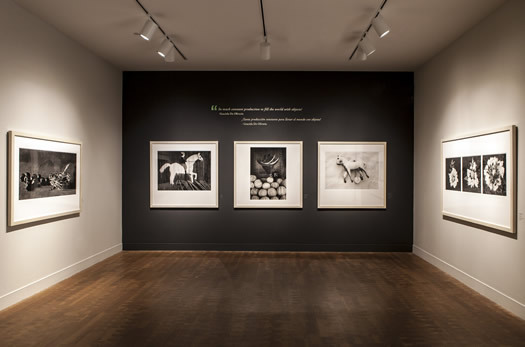 A major retrospective of her work, spanning four decades, just opened at the Museum of Photographic Arts in San Diego and runs through May 29. The show, “Trilogy,” offered in Spanish and English, explores Ms. Garduño’s principal themes within three groups: “Bestiarium,” “Fantastic Women” and “Silent Natures.” The show includes 96 images made in Mexico, Poland and Switzerland (where Ms. Garduño spends part of the year). “Bestiarium” includes some of Ms. Garduño’s early work in indigenous rural communities across Mexico. 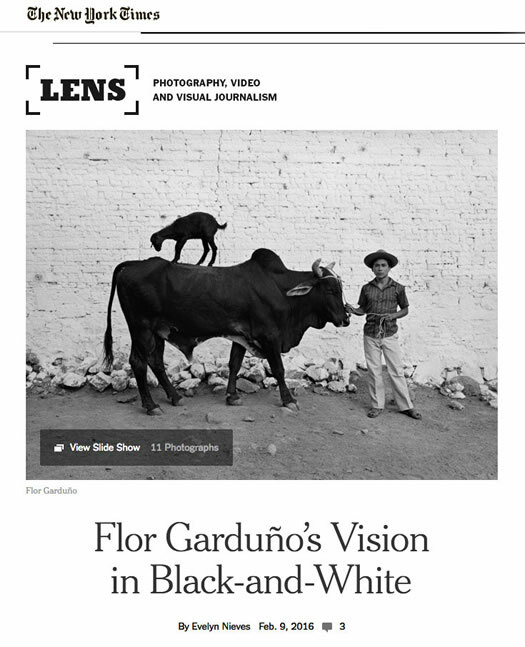 In the 1980s, Ms. Garduño took a government job photographing in Mexico’s countryside for use in textbooks. Working under Mariana Yampolsky, another Mexican photographer who influenced her, Ms. Garduño discovered her own style. One of the most striking images of this collection, shot in Mexico in 1987, depicts a man holding a bull by a rope while a goat stands on the bull (Slide 1). What does it mean? Does it mean nothing or everything about life? “Fantastic Women” features images that explore being a woman in this universe. One of the most striking, “Rapto,” depicts a woman in a gauzy toga, seen from behind, holding a raptor with outstretched wings in her outstretched hand. Silent nature includes surreal still lifes, many of them hard to encapsulate with words. Case in point: Ms. Garduño is currently working on a book of portraits, not necessarily in Mexico. Women have long been portrayed in art as inscrutable ciphers, from the ancient Greek Kore statues with their tight smiles to the Mona Lisa. But photographer Flor Garduño plays with those enigmatic representations, showing women as not only idealized and mysterious creatures but also powerful and self-fulfilled beings. 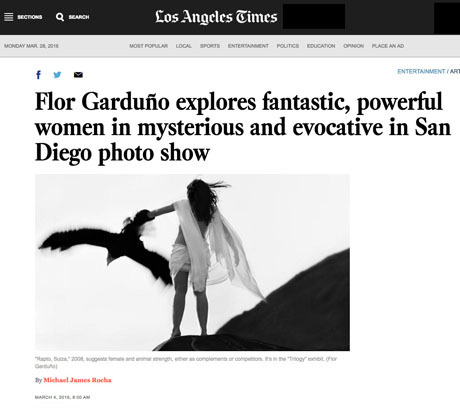 “Mujeres Fantasticas” (Fantastic Women) is one of three themes richly explored in the Garduño exhibition “Trilogy” at the Museum of Photographic Arts in San Diego through May 29. The show’s 96 works include pieces shot in Poland, the artist’s native Mexico and in Switzerland, where she spends part of the year. Reached by phone in Mexico City, Garduño said in Spanish that the “Trilogy” groupings — women, beasts and what she calls “silent natures” — reflect her interests throughout her career. Born in 1957 in Mexico City, Garduño studied visual art and then began working as a photographer in the early 1980s, when she landed a job taking pictures for the Ministry of Education. She gained recognition in Mexico first, then in the U.S. and in Europe, for photos of indigenous people, portraits and nudes, and for her street photography and still lifes. Many photos evoke myth and magic through unexpected pairings. “Rapto, Suiza,” from 2008, suggests female and animal strength, either as complements or perhaps as competitors. It shows a woman from behind, her body covered in a gauzy veil that billows in the wind. The bird’s broad wings seem to be lifting off from her hand. It’s impossible to tell where animal ends and woman begins. She could be about to take flight, or she could be anchoring the bird. Is the woman human or divine? The part of the exhibition themed “Bestiarium” explores animals and includes an image taken in Mexico in 1987. A man holds a bull by a rope, and a goat stands on the bull. The goat was known for standing on cows and bulls, and the photographer just captured the moment.